First things first. 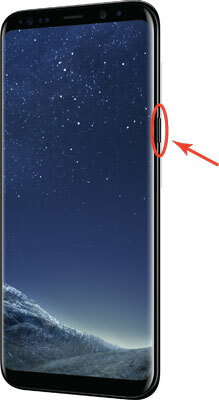 The Power button is on the right side of the phone. You can see where in the figure. Press the Power button for a second and see whether it vibrates and the screen lights up. Hopefully, your phone arrived with enough electrical charge that you won’t have to plug it into an outlet right away. You can enjoy your new phone for the first day without having to charge it. If the phone screen doesn’t light up (rats! ), you need to charge the battery. Here’s the rub: It’s important to fully charge the battery for 24 hours, or at least overnight, so that it will last as long as possible. That means that you have to wait to use your beautiful new phone. Sorry. As soon as you turn on your phone, several things happen. As the phone is powering up, it begins transmitting information to (and receiving information from) nearby cellular towers. The first information exchanged includes your phone’s electronic serial number. Every cellphone has its own unique serial number built into the hardware of the phone; the serial number in current-generation cellphones can’t be duplicated or used by any other phone. This electronic serial number is also called an International Mobile Equipment Identity (IMEI) number. It is 14 or 15 digits long. Cellular equipment is fine with long numbers. We mere mortals have enough trouble remembering 10-digit numbers, even with the hack of having only a limited number of area codes. To help you out, you get to use the shorter number and the cellular equipment happily keeps track of the 10-digit and the 14/15-digit numbers and shows you only what you can handle. It doesn’t matter to the phone or the cellular tower if you’re near your home when you turn on your phone — and that’s the joy of mobile phones. All cellular networks have agreements that allow you to use cellular networks in other parts of the country and, sometimes, around the world. That said, a call outside your cellular provider’s own network may be expensive. Within the United States, many service plans allow you to pay the same rate if you use your phone anywhere in the United States to call anywhere in the United States. If you travel outside the United States, even to Canada, you might end up paying through the nose. Before you leave on a trip, check with your cellular carrier about your rates. Even if you travel internationally only a few times yearly, a different service plan may work better for you. Your cellular carrier can fill you in on your options.